Fried calamari is one of my restaurant favorites that I had never considered making at home. For one thing, I was worried about handling the squid, let alone cleaning it and cutting it up. Then one day in the local mega mart they had squid on sale in neat little packages that didn’t look very intimidating. I picked some up and kept it in the freezer for two weeks before coming up with this paleo dredge to fry it up. These are very tender and delicious. They have a sweeter taste than restaurant variants due to the coconut and almond meal but are low carb, gluten free, and paleo! You can also easily go all coconut flour. I like to mix it up to get more nutrients as well as curb some of the sweet taste. Below is the easy 4 step process. Enjoy! 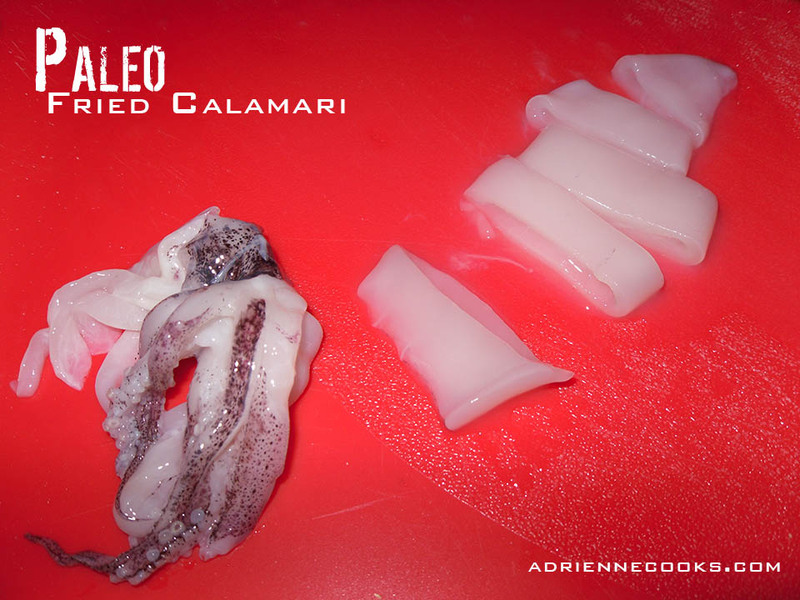 Rinse and slice your calamari into ¼ inch tubes and trim the two long tentacles from the bundle. You’ll have rings and small bundles of tentacles. Do not trim too close to the top of the tentacles or they’ll all be separate and unusable for frying! Take two zip top bags and one small bowl out. Beat your egg wash together in the bowl. Fill one bag with your flour and meal and spices, put the arrow root starch in the other. Heat your coconut oil in a skillet with tall sides to 350 degrees, uses a candy thermometer that does not touch the bottom of the pan. Using the starch first will make these nice and crunchy. For a softer fry, just use the egg and flour dredge. Dump your calamari in a zip top bag with arrow root starch. Shake the bag to coat the squid. 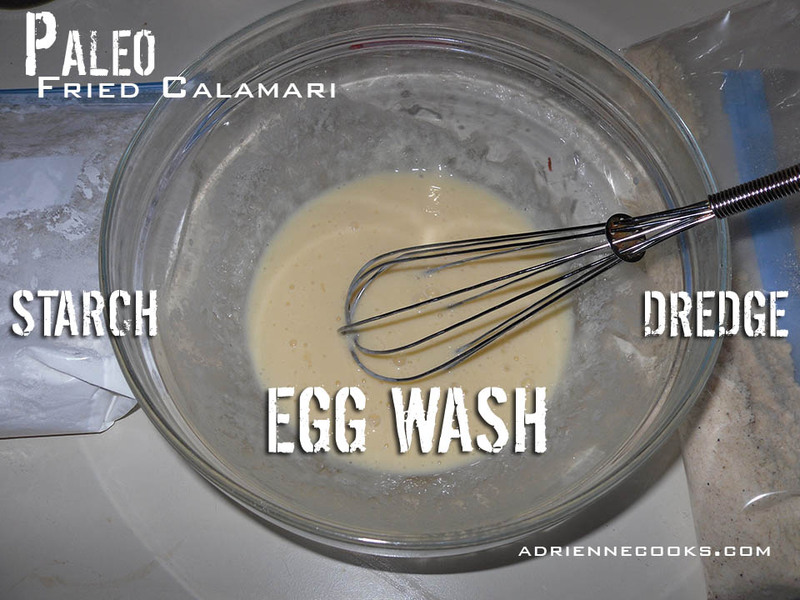 Shake off the excess and dip each piece into your egg wash mixture. Shake off the excess again and dump into your seasoned flour. Shake! Shake off the excess for a third time and plop these babies in your heated oil. Use chopsticks to flip when one side is golden brown. Fry your rings together and your tentacles together as they take slightly different times to get done. The tentacles seem to take less time. Drain on paper towels over a cooling rack. Once you’re finished frying everything, your first batch should be ready to eat without scorching your mouth! Dip in a homemade marinara sauce and Presto! You’ve got a restaurant worthy appetizer! I am going to try this, love the crunch! I love squid. I will definitely try this!